Ha, that sounds a little odd. But that's basically what I'm doing. 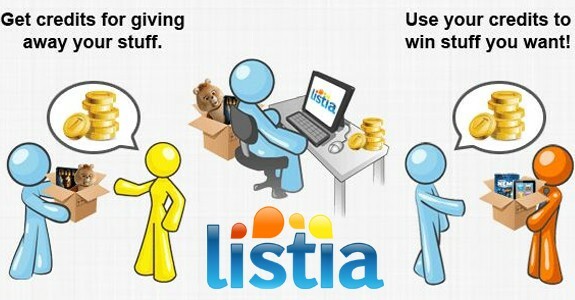 @jediknight52501 turned me on to the trading site, Listia.com, and I've been glued to it ever since. The site itself is a simple concept; you list stuff to give away (charge shipping or not, up to you) and people bid on it with 'credits' that they earn on the site and by giving their own stuff away. The idea is that you give some stuff away that you've got no real need for (instead of selling it on something like ebay) and use the points gathered from your auctions to buy stuff you want from others. You get 400 credits just for signing up and can earn more for using the site more. Thus far I've won just one auction, snagging a copy of Monster Rancher 3 (PS2). I bid on a copy of Hotshots Golf (Vita) but don't have enough credits to top the highest bidder anymore. I'm also winning bids on a silver PS2 controller and a copy of ATV Offroad Fury 3 (PS2). I'm watching a few auctions for PS2 systems (I really want a PS2 again) but also contacted a local seller on kijiji (a Canadian barter site) about a listing he had for a PS2 as well (which would allow me to pick it up, instead of getting it shipped), waiting to hear on that. If you're interested in the site, please sign up via my invite link that gives you a bonus 100credits and I receive a bonus of 500credit if you post your first auction. Oh, also, the entire site and process is completely free to use, no fees for posting or any of that kind of jazz you run into with ebay.